How to cut a pineapple? Many people claim that pineapples are their favorite fruit when they are little. Children are often so fascinated by this yellow fleshed fruit and gather around the table as they see that the fruit is served for them. Other children are even fascinated by the preparation of cutting a pineapple before it eventually be cut to pieces and ready to be eaten. However, once these children grow up, many would leave pineapples simply because they finally come to the realization that the preparation that looked awesome when they were young have changed into a tedious and time consuming job. Many adults would rather choose fruits that are easier to peel. Actually, avoiding such a delicious and nutritious fruit is not the answer. Cutting a pineapple is not as difficult as you think if you get the right coaching. Do you know how much time you should be spending for the preparation of a pineapple? Ideally, it should not take more than 10 minutes. So what would be the things to be done before cutting the pineapple, well of course you should have a nice and ripe pineapple. The easiest way to know if a pineapple is ripe is to smell the bottom part of it. If you smell the sweet smell of a pineapple, then it is ripe. If you smell that the pineapple is a little bit fermented, then it is overripe and it should be avoided. Overripe pineapples can also be detected by its firmness. Ripe pineapples are firm while the overripe ones are not. Visually, the ripe pineapple may not be the golden yellow color. If you see that it still has some green color on the sides, it is a ripe pineapple. But it does not mean that it should have all green color because it can only mean that the pineapple is not ripe. The next thing to do is to place a pineapple on the cutting board and slice the top crown. The ideal place to cut is about half an inch from the top. Still at the same position, cut the skin from top to bottom. 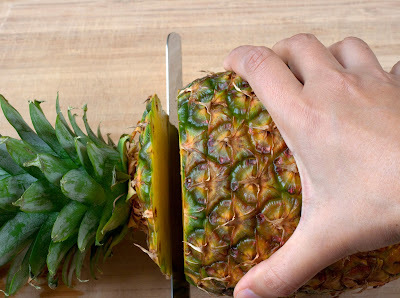 Cut only the skin and do not be too deep as to cut the eyes of the pineapple away. The outer area is among the sweetest area so it is best to keep it. So, the next thing to do is to remove the eyes with a smaller knife by cutting them diagonally. Once it is finished, you can cut however you want to serve it.